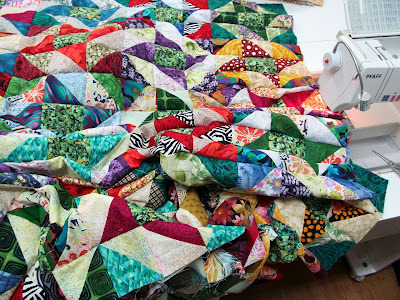 I got nine more horizontal seams sewn on the Friendship Star quilt top, three more to go. My granddaughter cooked a beef roast in the crockpot yesterday and invited her mom and dad and me over for a meal and the movie Beauty and the Beast. Everyone had been telling me how great the movie was and I have to agree with them. The Annabelle Hydrangeas are doing well. This one is right next to my front porch. I have another smaller one by the back of the house. 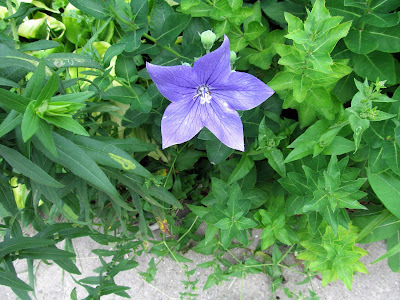 The first Balloon flower has bloomed. I read that they don't like to be transplanted but I'm going to try anyway. There is a whole row of them near the sidewalk. I'm going to try to remove the ones closest to the sidewalk and transplant them in the backyard garden. It was really hot yesterday so I only spent a small amount of time outside deadheading the last of the peonies and cutting some volunteer trees. Things are looking pretty lush around there. Quilt coming along great. Our hydrageas did exceptionally well this year, too. I like the Beauty and the Beast movie - saw it a few weeks ago and really enjoyed it. 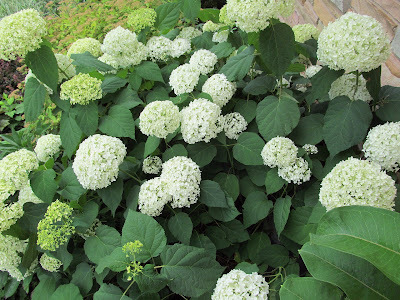 My hydrangea blooms later or else I haven't got any this year. It's always been picky. I just planted a balloon flower, it's kinda sick looking. 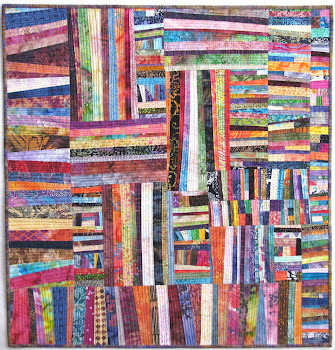 Your quilt dances with color and rhythm! I have so enjoyed these last few months, opening your blog each day. 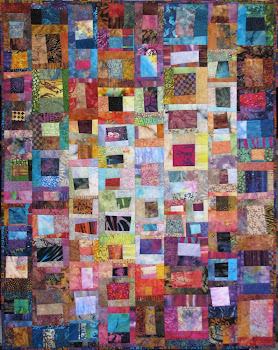 Quilting and gardening are really two fabulous labors of love. When you transplant the wee blue flowers, try to take a lot of the soil around them. Years ago someone told me that when plants don't transplant well, it usually is because they don't have enough of their original soil in their new home. Good luck and thank you for all of your wonderful sharing. Good going on the quilt top. Almost done! 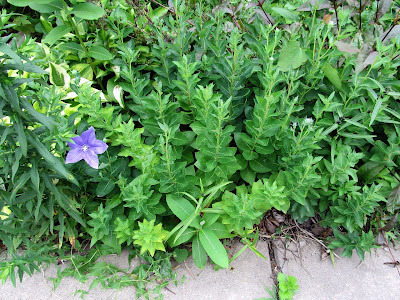 I saw a bell flower in the back that stuck it's head out of the surrounding Lenten roses and lily of the valley. I threw a few seeds down a long time ago and it comes up every year. Your garden is so lovely and lush looking. It's obvious you have a green thumb! Always nice to look at your work! I look forward to your daily posts about your quilts as well as the posts about your gardening and your Granddaughter cooking a wonderful roast for you all. Tonight it all really hit home, as I received the news tonight that my oldest Grandchild, my sweet Granddaughter (soon to be 21 Aug 5th), that not only has her Leukaemia returned after 7yrs but she only has a 15 to 65% survivor chance. I'm telling you all this to ask for your heart felt prayers for her and a few prayers for me as I am having a hard time with my faith right now, I am having such a hard time understanding how this can be allowed to such a sweet, loving and giving young lady, when there are so many evil dangerous people in our world right now. Please pray for healing powers for my granddaughter and that my faith with be renewed.